But true health is still a mystery to most people. We are living in a time that makes it very confusing to even know what healthy is. With all the diets and hype about what and what not to eat, we find ourselves constantly questioning our food choices. How did eating become so complicated? And how can we make it simpler? We can find an answer through understanding and respecting how our bodies are designed. Once we gain this understanding and respect, health comes naturally. Our bodies are designed to be in balance. More specifically, it is our internal body chemistry that must be kept balanced. When imbalance occurs, the signs of disease begin to rear their ugly heads: low energy; fatigue, digestive problems, weight gain, headaches, aches and pains, as well as the major killers—heart disease, diabetes and cancer. When balance is maintained, those signs disappear, weight stabilizes, and major illnesses begin to reverse. Maintaining balanced body chemistry—a term referred to as pH—is one of the basic necessities for good health—our lives literally depend on it. The term pH refers to the amount of acidity in a water-based medium. Human blood and body fluids are all water-based. Alkalinity basically means the absence of Hydrogen, or the opposite of acidity. 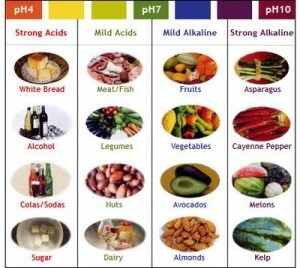 The acid/alkaline scale (pH scale) ranges from 0 to 14, with 7 being neutral. A pH less than 7 is acidic; a pH greater than 7 is alkaline. Our bodies are designed to be slightly alkaline at a pH of 7.4. Like the Richter scale that measures earthquakes, the pH scale is logarithmic, which means that a pH of 6.4 is ten times more acidic than a pH of 7.4, and a pH of 8.4 is ten times more alkaline than a pH of 7.4. Even small changes in pH can cause great damage or great health. The normal functions of our body create small amounts of acid. For instance, when we exercise, our muscles create lactic acid. Breathing, cell building, and burning calories to fuel the metabolism are also normal functions of the body that create acid. It is critical that the pH of the blood stays between 7.35 and 7.45, and even slight deviations can result in disease or death. To keep your blood in the ideal range, your body has a number of systems that are adept at neutralizing and eliminating excess acid from your blood. But sometimes that comes at a great cost to your health in other ways. A healthy body stores adequate amounts of minerals in our bones, muscles, tissues, and teeth, that can be drawn upon to neutralize the acidity created by normal body functions. These minerals, called the “alkaline reserve” include calcium, iron, magnesium, manganese, potassium and sodium. But the minerals in our alkaline reserve are not infinite, and there is a limit to how much acid even a healthy body can cope with effectively. We need to replace these minerals regularly by eating the foods that contain them. To maintain our proper body pH, the majority of our foods should be alkaline forming, and the acid-forming foods should be minimized. 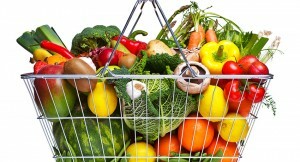 The alkaline forming foods contain the minerals that replenish our alkaline reserve. However, the typical diet of most Americans is the exact opposite. fats, dairy products, and all the junk foods are acid forming. The most acid-forming foods are refined carbohydrates—white sugar and white flour–in addition to sodas (especially diet sodas), artificial sweeteners, alcohol, coffee, and prescription drugs. Eating too many of the acid-forming foods and not enough of the alkaline-forming ones results in excess acidity, which overwhelms the body’s alkaline reserve. It’s like continuing to draw money out of a dwindling savings account, without replacing it. The alkaline reserve consists mainly of calcium, which is drawn from the bones, tissues, and teeth. When calcium is continually removed from the bones, without adequate replacement, you end up with a calcium deficiency. 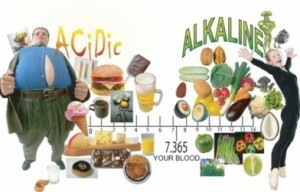 When your alkaline reserve becomes chronically low, your body is less able to neutralize additional acid coming in. As a result, other defense mechanisms are employed to protect your blood and organs from getting overly acidic. This may sound like a good thing, that your body is working hard to keep you alive despite your poor diet, but this is how many health problems begin. To keep excess acid from entering your vital organs, your body creates fat cells and then quarantines the acid inside them. These additional fat cells lead to weight gain and obesity. Your body then holds on to this fat as a way to continue protecting the organs. 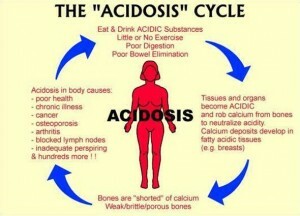 Hence, when your body is acidic, you gain weight that is very difficult to lose. Another place your body stores acid is in your muscles. Acidic muscles lead to low energy, muscle cramps, and chronic fatigue syndrome. Your body may also try to expel acid through the skin, causing hot flashes, strong perspiration, psoriasis and rashes. Acidic body pH is responsible for arthritis, chronic fatigue, heart disease, strokes gout, high cholesterol, diabetes, cancer, acid reflux, high blood pressure, overweight, and obesity, and many, many more serious health problems. Your regular diet will not produce an optimal body pH until you are consuming the appropriate amount of alkalizing foods that offset the acid producing foods you eat. A properly balanced diet consisting of 80% alkaline forming foods and 20% healthy acid forming foods is recommended. That’s right, it’s that simple. All you have to do is eat more alkaline forming foods than you do acid forming foods, and you are on your way to long-term health. 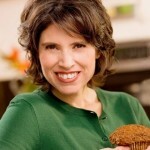 My books The Science of Skinny and The Science of Skinny Cookbook can help you achieve the right balance. Begin your weight loss journey with a delicious, realistic way of eating!